A rendering of the full mural. Some changes are expected. The Siskiyou County Board of Supervisors has approved an artist's rendering of a mural that honors UC Cooperative Extension advisor and county director Steve Orloff, who passed away in late 2017, reported Danielle Jester in the Siskiyou Daily News. The mural also depicts Siskiyou County's agricultural heritage. 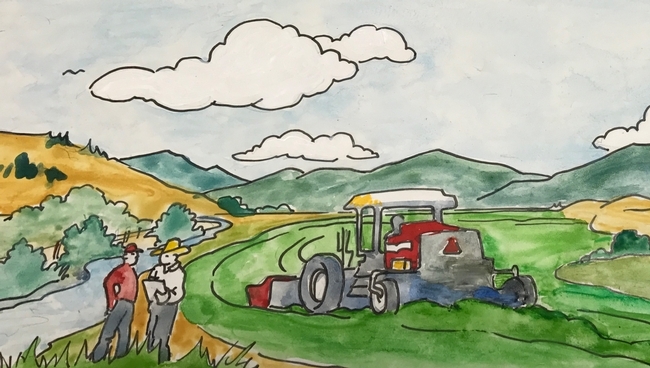 The mural will be painted on the south-facing wall of the UCCE office, a county owned building, said Rob Wilson, the UCCE advisor and director of the UC Intermountain Research and Extension Center who is serving as interim county director for Siskiyou County UCCE. County resident Sari Sommarstrom said that, about a year before Orloff's passing, she contacted Orloff about the UCCE headquarters "boring building." Orloff responded that, “Our office is not only boring, it is ugly.” Orloff pursued having a mural painted on the cooperative extension building's wall about 15 years before, but it never went anywhere. Mount Shasta-based artist Kim Solga has been selected to paint the mural. The mural includes a small rendering of Steve Orloff. He is shown wearing a cowboy hat and holding a clipboard. Super terrific tribute to Steve, a great farm advisor who truly connected with his community and made a difference by enriching people's lives.